Melissa Aigilo does not hide the fact that she is passionate about writing and its role in shaping Papua New Guinea. At only 25, Aigilo is currently the country’s leading woman writer, with a book of poetry, Falling Foliage, published in 2005. A collection of short stories and another anthology of poetry await publication. This immensely-talented and intelligent young woman has a big following, especially among high school students, and her work is even being studied in the USA and Australia. 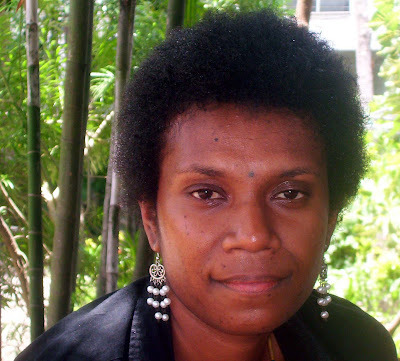 Her mentors, especially University of Papua New Guinea literature lecturers Dr Steven Winduo and Russel Soaba, extol the virtues of their protégé. Soaba compares her writing to that of the great English woman writer Emily Dickenson. However, as I found out, Aigilo is a quietly-spoken young woman who shuns the limelight to dwell on writing. “My one book is called Falling Foliage,” she tells me. “I also have my poems which are recorded on CD and tape in the International Library of Poetry in America. “Falling Foliage was published in 2005. “I’ve written two books so far which haven’t gone in for publication. “One is a collection of short stories and the other is an anthology of poetry. “ABC has a website where my poems have been aired. “The University of Melbourne analyses some of my poems in their literature classes. “Since my book was published, a lot of high schools and international schools have been ordering a lot. “I think they’ve run out of copies at the university bookshop. In saying this, Aigilo empathises with the women of Papua New Guinea, saying that they are not given enough support to air their voices. “If only other women writers were given that same support, we could change the face of Papua New Guinea because writing is a very powerful political tool. “Women have as much to offer as men and their views and opinions need to be expressed. “Some important issues (concerning women) are still not addressed by today’s government and need to be looked at seriously. “It is my very strong belief that women are the backbone of society. “So I’m calling on people in authority to give women a chance to voice their concerns, politically, and socially, through writing. Aigilo graduated from the University of Papua New Guinea in 2006 with a Bachelor of Arts in Literature degree. She was at university from 2001 to 2005, including a year studying law; however, she found that she preferred the solitude of writing to noisy courtroom antics. Before campus, Aigilo attended St Joseph’s International Primary School, Marianville Girls Catholic High School, and then Port Moresby National High School. She is the eldest in a family of two sisters and two brothers. Her father, former Police Commissioner and graduate lawyer Peter Aigilo, played a significant role in her opting for a life of writing. One of her poems , The Guardian, published in a recent issue of the literary publication , Savannah Flames, is dedicated to her father. “My dad is my mentor,” she says. “As a woman, I can say that. “I like writing anything to do with prose, poetry, short stories, drama, plays. “I think when I began to learnt how to write, I came up with ideas. “Basically, because my dad is a lawyer, he emphasised reading and he is a reader himself. “He used to read to me when I was younger, and that opened up my avenues for creating, so when I learnt to write, I put that creativity on paper. “Writing is a form of liberation for me because I guess I’m a quite person. “What I think and feel is expressed on paper. “I find that poetry is like my journal. “I am able to hide behind my words, and the style of poetry that I write is abstract. “It’s a form of release for me. Aigilo could be described as a true Papua New Guinean, seeing her family connections. “I’m from four provinces,” she elaborates. “I’ve always wanted to pass on my skills of writing to students, so while writing remains my No.1 passion, my second goal in life is to teach creative writing and literature. Aigilo is blunt about her belief that writing is one of the most-important things in any society. “I would say that, as I said, writing is a very powerful political tool. “There are two forms of literature. “The one that is oral is spoken and forgotten about. “But the one which is written is preserved, and can be looked at to pave the way for the future in any aspect, whether it be social, political, religious. “I believe that writing can change the way in which people think. “The mind is a very complex thing. That's what you already have. So they come out as inscriptions. When it reads your markings? In my mind and I envision you. Would you remember my concealed scripts? Love that Scriptwriters poem, abit of eerie feeling there.Ooh shivers!